Edmonton has some really beautiful architecture like the pretty Victorian terrace Angel Place with its ivy covered frontage and pillared front doors. Salisbury house, now an art gallery is also a masterpiece of Victorian architecture and has been given grade two listed status. So it was with great pleasure that Hog Roast Edmonton headed to the cricket club to cater for a members evening. Being a warm night the members thought an outdoors event would be best: with the brightly green cricket lawns sweeping down to the tree lined verges it was a great back drop for the hog roasters and guests alike. Arriving in plenty of time we had no trouble wheeling our hog roast oven through the car park to a nice spot just in front of the club house where the guests were able to use the bar inside. The tables and chairs outside were mostly empty at the start of the evening, but as the hog roasted pig we had been asked to prepare began to waft its delicious aroma around the grounds and into the club house, the guests gradually began to appear to see just where the amazing smell was coming from. 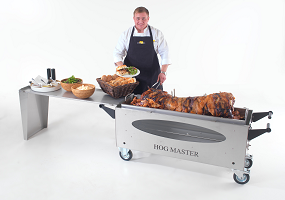 When you decide to book a hog roast caterer for your event, you don’t just get the finest quality food, you also get all the pageantry of the spit roast. There’s something very special about having your meat cooked in front of you: being able to smell the roast as it cooks builds up the appetite and seeing the chefs at work gives you a certain reassurance that your food is being handled properly. And this is what the Hog Roast Edmonton team do best. Our highly trained chefs produce meals of exquisite quality time and time again as anyone who has tasted them will know. For the cricket club event we spit roasted a whole pig which we served with our own apple sauce, our specially blended stuffing and of course there was plenty of our excellent crackling to go around! To compliment the tender roast pork we also prepared a selection of tasty salads. It can take several hours to roast a whole pig, so we take advantage of the time by using it to make the salads, this way they are always served fresh and crisp with Hog Roast Edmonton dressings. The evening was a huge success. The guests were completely satisfied with their meal. Some were even interested with the hog roasting process and our custom designed oven and had a little chat with the chefs. We are always happy to talk about what we do as it gives us invaluable feed back in creating the finest possible service, which it is our professional goal to do. Hog Roast Edmonton prides itself on the highest possible catering standards whether catering for small parties or large formal events. We offer a friendly and flexible service so you get exactly the catering you want at your event.